I received several cogent comments on my post A.J. Jacobs Cousin Connections - Um, Not Really (10 September 2014) - even one from A.J. himself! 1) Geoff Trowbridge noted: "Via the ever-resourceful E. Randol Schoenberg, it turns out that both you and A.J. are descended from King David, at least according to tradition. "So there is a common bloodline, albeit not one that is easily verifiable. ;-)"
2) Ashley Odell offered: "I still don't get why people are surprised that it's been difficult to get him directly connected to most celebrities. Jacobs is Jewish. He connects as a direct, even rather close cousin to many Ashkenazi Geni users -- users who happen to be one of the most thriving, vibrant parts of the userbase -- but of course he's not going to be very close to people tracing our Mormon and Mayflower ancestry. Were people expecting that? "3) instead of blog after blog making this same post over and over, why doesn't someone take a constructive approach and propose a better way Jacobs can communicate his idea about connection in a way that doesn't irritate genealogists so much? He's still writing the book. He has an e-mail address. He replies. Make a difference if you want. Now is the time. Maybe I'll even co-sign whatever thoughtful correspondence you post here. But this argument without advisement is becoming white noise. You're a smart guy, Randy. Solve the problem." 3) A.J. Jacobs commented: "Hey Cousin Randy! Thanks for the post. And thanks for the positivity (e.g. that the Global Family Reunion will be fun -- it will!) as well as the skepticism about whether we are truly 'cousins' with these historical figures. You make a good point. "I know we're using the word 'cousin' in a pretty broad sense of the word. But if you Google the word 'cousin,' the second definition, right after 'a child of one's uncle or aunt' is this: 'A person belonging to the same extended family.' In that sense, I think it's fair to say that these folks are all cousins, even the ones who don't share a bloodline that we can identify yet. As Ashley says, we want to show connections. "I suppose I like the expansive definition of family -- that it should include marriages as well as DNA. I consider my brother-in-law family (and he'd be quite annoyed if I didn't). "Plus, as we all know, we DO share the same bloodline if you go back far enough -- to mitochondrial Eve and Y-chromosomal Adam. "Part of my hope with the Global Family Reunion (along with raising money for Alzheimer's and getting more people hooked on genealogy) is to make people realize that we are, in the broadest sense, part of the Human Family. That we share 99.9 percent of our DNA. So that's my long-winded answer as to why we use the term 'cousin' broadly. 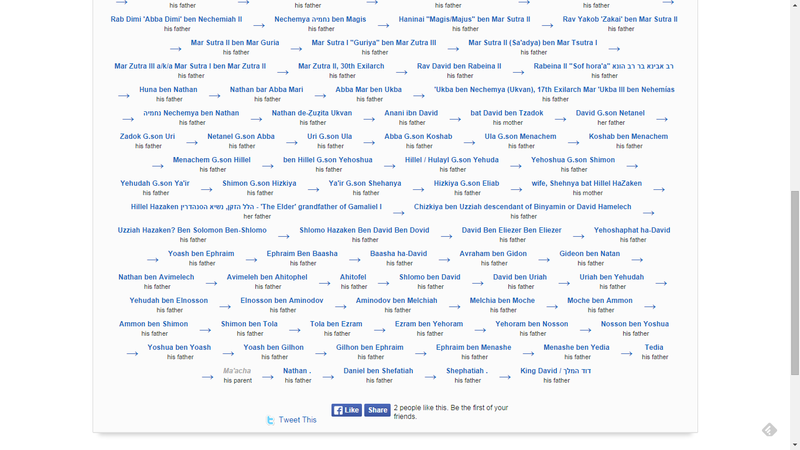 "I think of your project as worldwide mishpocha. Maybe that concept is lost on people used to insular genealogy, where research is conducted through specific surname societies and reunions involve an admission fee. "My Old New England WASP family reunions involve handshakes, Robert's Rules, and the rigid, clinical definition of 'cousin.' My mixed-race West Indian family reunions involve hugging, all fun and no business, and everyone addressing each other as 'cuz' regardless of relationship. I think the genealogy community needs to remember that a majority of Americans fall into that second category when it comes to thinking about family. Applying the Anglocentric concept to everyone is a losing battle. Time to accept a shift in definition and thinking." I have several responses to the commenters. 1) I appreciate the discussion content and tone. Thank you to Geoff, Ashley and A.J. for their comments, and for not calling me names. 2) I was not aware that A.J. is Jewish and has an extensive Jewish ancestry, and that this really restricted his family tree and his links to non-Jewish cousins. "A cousin is a relative with whom a person shares one or more common ancestors. In the general sense, cousins are two or more generations away from any common ancestor, thus distinguishing a cousin from an ancestor, descendant, sibling, aunt, uncle, niece, or nephew." 4) It was from that understanding, as Ashley pointed out, that I based my blog post. "In anthropology, kinship refers to the web of social relationships that form an important part of the lives of most humans in most societies, although its exact meanings even within this discipline are often debated. " "Broadly, kinship patterns may be considered to include people related by both descent (one's social relations during development), and by marriage. Human kinship relations through marriage are commonly called "affinity" in contrast to the relationships that arise in one's group of origin, which may be called one's descent group. In some cultures, kinship relationships may be considered to extend out to people an individual has economic or political relationships with, or other forms of social connections. Within a culture, some descent groups may be considered to lead back to gods or animal ancestors (totems). This may be conceived of on a more or less literal basis." 6) I think that A.J. 's "Global Family Reunion" is a Kinship event. The way he describes it in his comment to me is a classic example, I think, that meets the Kinship definition well. 7) It's great for A.J. to highlight his kinship to other individuals (I do it too!) - but I would prefer that he call them "Kinship Connections" instead of "Cousin Connections." 8) I'm always amazed at how diverse the USA is. We can only follow the threads back in time and connect to ancestral homelands and distant cousins in those places, and marvel at the relationships. As A.J. notes, we are all related - the mystery is when and where. For A.J. and me, the most recent common ancestor (MRCA) is probably back in medieval Europe or even the Dark Ages. 9) Actually, Geoff's comment indicates that A.J. 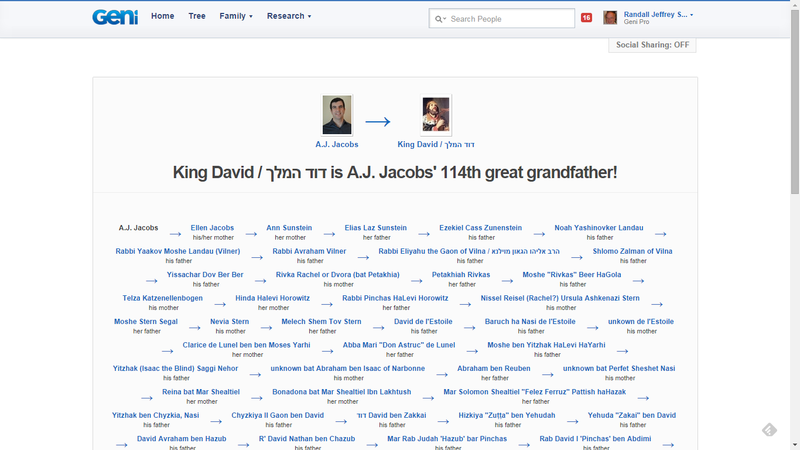 and I do share at least one common ancestor: King David from Biblical times. I can vouch that my line back to Deborah Bachiler is correct, but I don't know about the other 80-some generations. So King David is A.J. 's 114th great-grandfather. 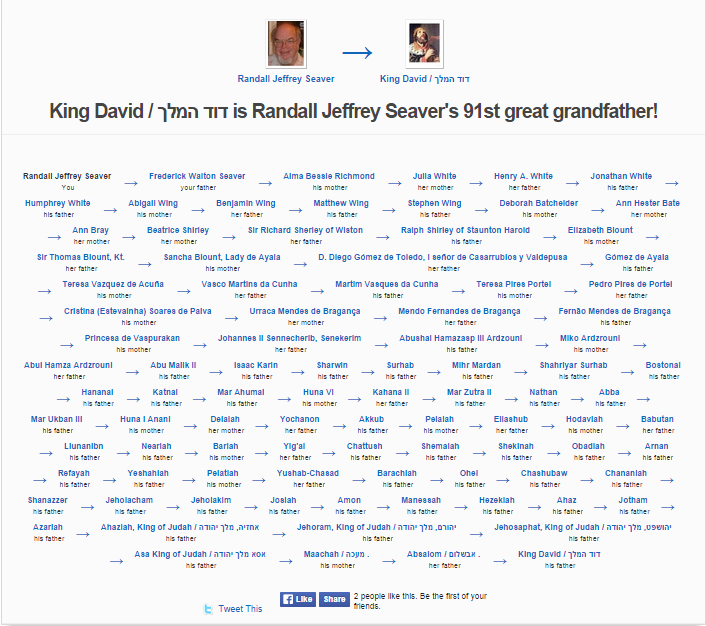 My thanks to E. Randol Schoenberg for finding the King David link for both of us. That makes A.J. and me probably 92nd cousins 23 times removed? A skeptic would ask why is there a big difference in the number of generations? One answer might be that folks in his line married younger and had children younger. But 23 generations? The right answer is probably that the genealogy research before 1600 or so is suspect - one or both of the lines may have missing ancestors or phantom ancestors. As Geoff noted in his comment - "So there is a common bloodline, albeit not one that is easily verifiable." There are about 3,000 years between the putative birth of King David and myself. At 4 generations per century (a birth every 25 years on average), that works out to 120 generations. If you look closely at the birth dates of persons in each descent from David, you'll see gaps in birth dates, and many estimated dates. But then, I expect that because there probably aren't birth records for any of them before about 1800. The relationship charts above are from Geni.com. I don't know, and haven't really investigated, if the pre-1600 information on Geni is from the published and authoritative royal and noble works for non-Jewish families. I have no clue about the Jewish ancestries - perhaps a reader can comment on them. The bottom line for me is that A.J. Jacobs is throwing a "Global Family Reunion" on 6 June 2015 in New York City and we're all invited, and we should enjoy our kinship. I'm looking forward to it! Party on! Showing a connection to King David today is mere hearsay. It is impossible for a Jewish individual (or anyone) to trace back to David directly. There are many families who believe they are of Davidic descent. There is even a society for such families. Unfortunately DNA evidence does not exist, and every family history for David has essential gaps; I have seen some of the best and there are still gaps. It is a lovely romantic notion of being descended from him, handed down in some families as tradition and family lore, but it simply cannot be proven by anyone today, despite the claims of some. Sorry, Randy! Thanks Randy! I love the terms 'kin' and 'kinship.' I was going to name the Global Family Reunion something like "The Great Kinnection", but I decided it was too punny.